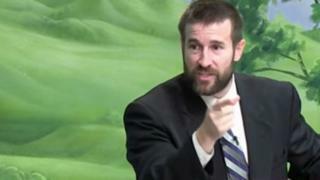 South Africa has barred controversial US pastor Steven Anderson from visiting the country because of his critical remarks about homosexuality. The home affairs minister said he was refused a visa as the constitution prohibits hate speech. Mr Anderson runs the Faithful Word Baptist Church, which says that homosexuality is an abomination punishable by the death penalty. He said that religious freedom no longer existed in South Africa. "I feel sorry for people who live in South Africa, but thank God we still have a wide open door in Botswana," Mr Anderson posted on his Facebook page after the decision to refuse him a visa. The BBC's Milton Nkosi in Johannesburg says Mr Anderson was invited by a local church to visit this month. "I have identified Steven Anderson as an undesirable person to travel to South Africa," Home Affairs Minister Malusi Gigaba said. Mr Anderson's church is based in the US state of Arizona and describes itself as an "old-fashioned, independent, fundamental, King James Bible only, soul-winning Baptist church". In a video posted on YouTube before South Africa's decision was made, he said that the trip was not going to be about homosexuality, but he stood by his views against homosexuality, which he said were endorsed by the Bible.